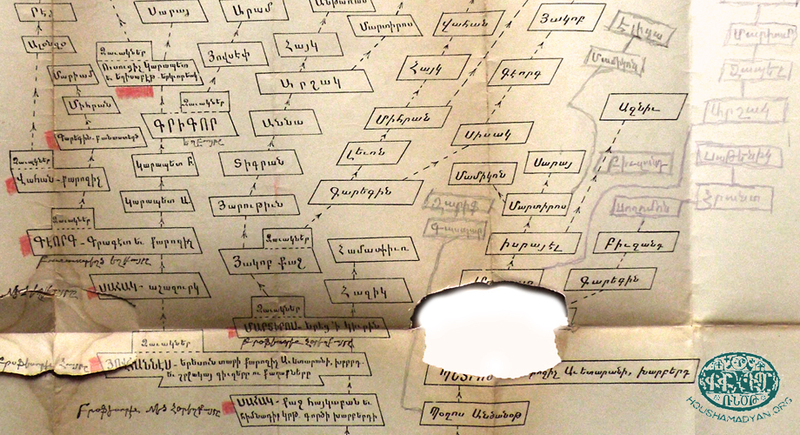 The Beshgeotyurian/Beshgetoorian (from Harput) family tree prepared in 1925. You can see a copy of the complete version of the family tree below. The town of Kharpert [Harput] spreads out around a fortress at the top of a hill overlooking the fertile plains of the district that shares its name. 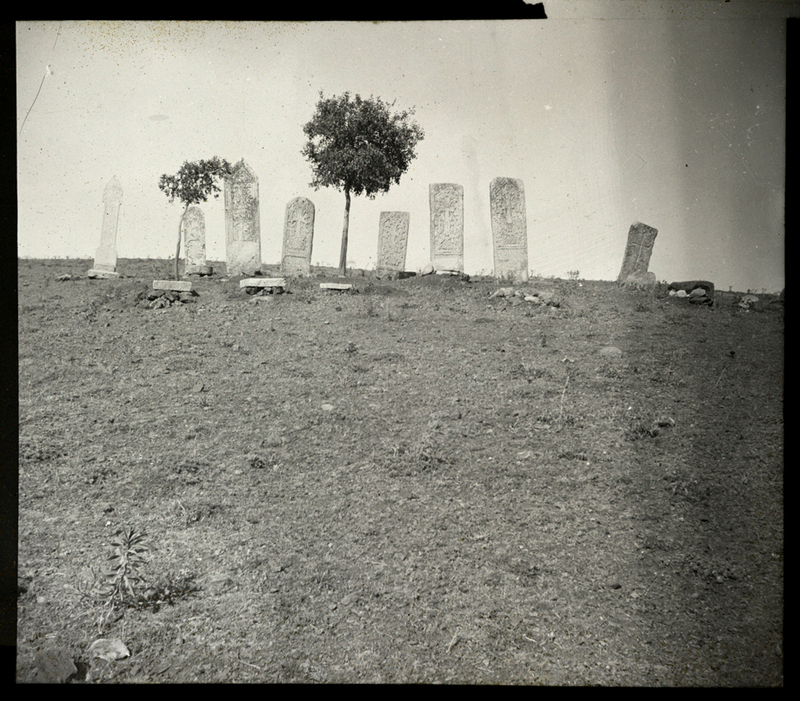 In the early 1800’s, the seat of government had moved to the arable land at the base of the hill, Mezire/Mezre. Soon after, the name was changed to Mamuretul Aziz [Elazığ]. By the second half of the 19th century, Mamuretul Aziz had been separated from Diyarbakir to form a distinct province [vilayet]. Throughout the last century of the Ottoman empire, approximately 70 villages contained Armenians in the central district [kaza] of Kharpert. The controversy over the number of Armenians living in the Ottoman empire seems to have limited those willing to make use of both Ottoman and Armenian sources in demographic analysis. As will be seen from the below analysis, contrary to being in conflict, the various sources are complementary and critical comparisons can assist in quantifying both the strengths and weaknesses of each. A number of Ottoman era census registers are available in the General Directorate of State Archives of the Prime Ministry of the Republic of Turkey [T.C. Başbakanlık Devlet Arşivleri Genel Müdürlüğü]. Detailed registers for the Kharpert district are available for 1834 [1250 hidjra] and 1840 [1256 hidjra]. Information on age, occupation, height, tax classification, etc. are supplied for each male. A less useful register from 1846 [1262 hidjra] also exists, but only includes information on the guarantor for taxable males. Thereafter, only summary data is available in Armenian and Turkish sources. There are significant gaps in the coverage of this data. The first 51 pages of the 1834 Ottoman census for non-Muslims is missing, thus it is not possible to determine how many total males or households were recorded. In aggregate, there were 16392 Christian males in 4204 households detailed in the 1840 Ottoman census for the Kharpert district. Armenians comprised over 98% of the Christian population. A small Assyrian population lived in two locations, the town of Kharpert and the village of Ayvoz. However, Ayvoz was either not enumerated or was not included in the Kharpert district in this census. For the villages recorded in both the 1834 and 1840 censuses, there was a 7.5% decline in the Armenian male population. Surely, the population was much more mobile than possibly imagined and a good number of men were away from their hometown for significant periods of time working in Adana and Istanbul, for example. But those working elsewhere were still recorded in the census in their hometown. Thus, another explanation may be necessary. Was the Armenian population in decline, unable to fully replenish itself, or after the initial census were Armenians better able to avoid the census to reduce their tax obligations? I made adjustments to both the 1834 and 1840 Ottoman censuses for missing village data. In essence, I compensated by estimating the missing data in the same proportion as the known data. I have not adjusted for any shortfall indicated by an analysis of the age distribution. The resulting estimate is 18338 non-Muslim males in 4108 households in 1834 and 17081 non-Muslim males in 4384 households in 1840. Population figures from the 1312 (1894) Mamuretul Aziz "salname"
In 1878, the Armenian Patriarchate sent questionnaires to its diocese across the empire. The response from the Kharpert diocese has survived with details on the population of Armenians, Assyrians, Turks and Kurds by village. In “Toros Aghbar, a Traveler Through Armenia,” Karekin Srvantsdiants supplies the number of households consistent with the 1878 Kharpert population figures. Hereafter referred to as the 1878 Armenian census, the population of Kharpert was 42766 Armenians, 740 Assyrians, 35676 Turks, 28816 Kurds and 3220 Kizilbash. Srvantsdiants stated the Armenian population lived in 5250 households. Adjusting for known deficiencies, I estimate the Armenian population was 43042 in 6005 households. The provincial yearbooks [salname] for Diyarbakir during the time period when Kharpert was included do not detail the population for the district. Even when labeled as representing the district [kaza] or county [sandjak], the population is too low to actually be the case. For instance, the 1876 [1293 hidjra] Diyarbakir provincial yearbook stated the population for the Mamuretul Aziz county as 16503 Muslim males and 14678 non-Muslim males in 13200 households. By 1881 [1298 hidjra], Mamuretul Aziz was separated from Diyarbakir and published its own yearbook. The population was supplied in more detail. The district contained 25274 Muslims, 15069 Armenian Apostolics, 1157 Protestants, 523 Catholics, 203 Greeks, and 319 Latins in 21569 households. Again, only males were reflected in these population figures. The 1894  Mamuretul Aziz yearbook was unique in that the population was detailed by gender, religion and village. The following population totals were calculated from the village detail. The Kharpert district contained 57553 Muslims (29617 males and 27936 females), 32522 Armenian Apostolics (17020 males and 15502 females), 756 Catholics (386 males and 370 females), 4529 Protestants (2373 males and 2156 females), 446 Latins (230 males and 216 females), 44 Foreigners (22 males and 22 females) and 36 Greeks (19 males and 17 females). However, Armenian women were consistently undercounted and to a greater degree than Muslim women, particularly in mixed villages. Thus, the total Armenian population was at least 40,000 based on the 1894 yearbook data. This represents an 18% increase in the Armenian population from the 1881 yearbook. In the early 1900’s, Soukias Eprigian published his monumental “Illustrated Dictionary of Historic Homeland.” The population figures for Kharpert updated the Armenian population from that contained in Srvantsdiants but left the Muslim population unchanged. The updated population was 38407 Armenian Apostolics, 1416 Protestants and 284 Catholics. However, the Armenian population figures seem to represent a period between the 1878 Armenian census and the 1894 Mamuretul Aziz yearbook. Possibly 300 Armenians should have been added to this figure for a couple of missing villages. On the eve of the genocide, the Armenian Patriarchate again requested population figures from its dioceses and Kharpert was stated to have 39788 Armenians in 6166 households. At the same time, the 1905-7 Ottoman census was updated for births and deaths to arrive at a population as of 1914. The population for Kharpert was given to be 78906 Muslims, 31244 Armenian Apostolics, 1448 Armenian Catholics, 5528 Protestants, 541 Latins, 991 Assyrians and 36 Gypsies. If you consider that most, if not all, of the Protestants were Armenians, the resulting total of 38220 Armenians is very close to the Patriarchate total. The figures as presented indicate that the Armenian population of Kharpert remained relatively static for almost a century, never deviating much from approximately 40,000. The Armenian population peaked around 1880. The 1894-6 Hamidian massacres, forced conversions to Islam and immigration not only constrained growth, but led to a decline. During the same time period, the Muslim population grew by approximately 20%. However, it should be kept in mind that the nature of census taking always leads to undercounting, even with modern methods. Thus, the population figures are a way of understanding the demographic changes of the villages, but not definitive values for the number of Armenians living in the Kharpert district. Detailed analysis is necessary to expose observations that are masked when only using aggregate data. What follows is an analysis of the population in villages once inhabited by Armenians. The names given in brackets are the current or most recently used name for the villages. There were two villages in the Kharpert district with this name. One village was in proximity to Munzur-Oghli, now under water, and the other near Arpavud. The village near Munzur-Oghli is only known through maps. It was not listed in any republican era census. My assumption, based on the information available, is that the village containing Armenians was what is now known as Kavakpınar. The village of Agh-mezre is not listed in certain early Armenian sources, such as Srvantsdiants, and Eprigian. However, the 1834 Ottoman census details 104 Armenian males in 25 households and 61 Muslim males in 14 households. Another census was carried out in 1840 with 95 Armenian males in 36 households recorded. Surprisingly, the 1878 Armenian census stated the village contained only 120 Turks, no mention of Armenians. By 1894, the Mamuretul Aziz provincial yearbook stated the village contained 145 Armenians (66 males and 79 females) and 19 Muslims (8 males and 11 females) in 33 total households. I am not sure of the reason for the drastic reduction in the Muslim population, but the slow decline in the Armenian population continued and on the eve of the genocide Agh-mezre contained 125 Armenians in 21 households. The Armenian population lived in Verin (upper) Aghntsik, while the Muslim population resided in Varin (lower) Aghntsik. The new location of Elmapınarı is slightly south of the old locations which are now underwater. The 1834 Ottoman census recorded 196 Armenian males in 36 households and 74 Muslims in 20 households. While the 1840 census recorded 191 Armenian males in 38 households. In the 1878 Armenian census, Aghntsik was reported to have 411 Armenians in 60 households and 111 Turks. Eprigian stated the village had 401 Armenians and 115 Turks. 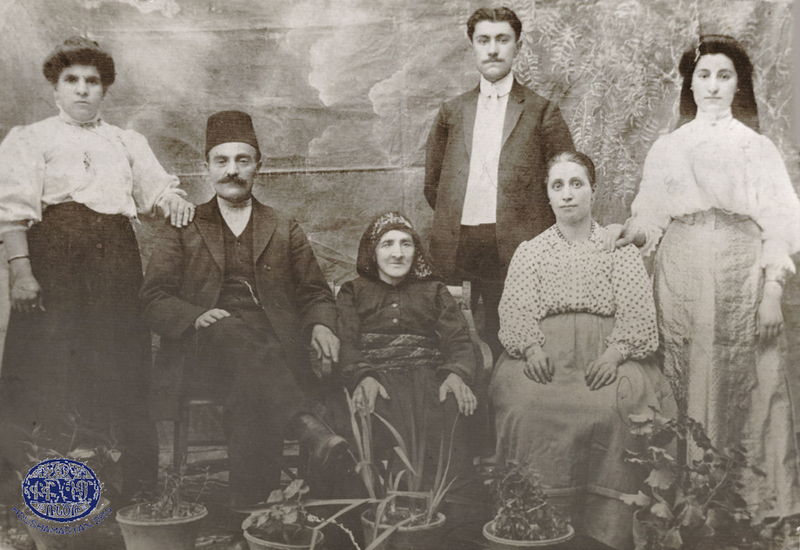 The 1894 Mamuretul Aziz provincial yearbook stated there were 349 Armenians (190 males and 159 females) in 68 households. The high male to female ratio indicates a probable undercount of women. In addition, the yearbook stated there were 118 Muslims (63 males and 55 females) in the lower village in 28 households. On the eve of the genocide, the Armenian population had grown to 450 in 70 households. Varin Aghntsik was flooded by the Keban reservoir and Verin Aghntsik was relocated. Akhor is another of the villages that is now underwater from the Keban reservoir. The location of these villages has been estimated from older maps. The 1834 Ottoman census detailed 246 Armenian males in 47 households and 28 Muslim males in 8 households in Akhor. The 1840 census detailed 243 Armenian males in 58 households. The 1878 Armenian census stated Akhor was entirely Armenian and the population had significantly declined to 261 in 36 households. Eprigian stated there were 242 Armenians in the village without specifying any Turkish population. 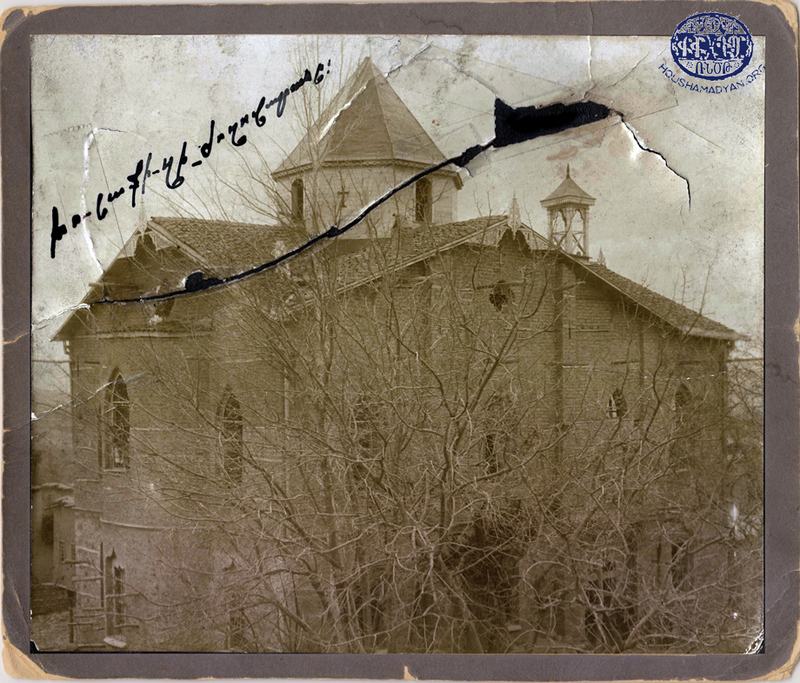 The 1894 Mamuretul Aziz provincial yearbook indicated the village as almost entirely Armenians with 270 Armenians (140 males and 130 females) and 11 Muslims (7 males and 4 females) in 54 total households. On the eve of the genocide, the Armenian population had again declined to 165 in 25 households. Arotsig is now also under the waters of the Keban reservoir. The 1834 Ottoman census detailed 142 Armenian males in 33 households in Arotsig while the 1840 census detailed 125 Armenian males in 41 households. The 1878 Armenian census indicated Arotsig was entirely Armenian with a population of 355 in 40 households. Eprigian recorded a slight decline in the Armenian population to 330. 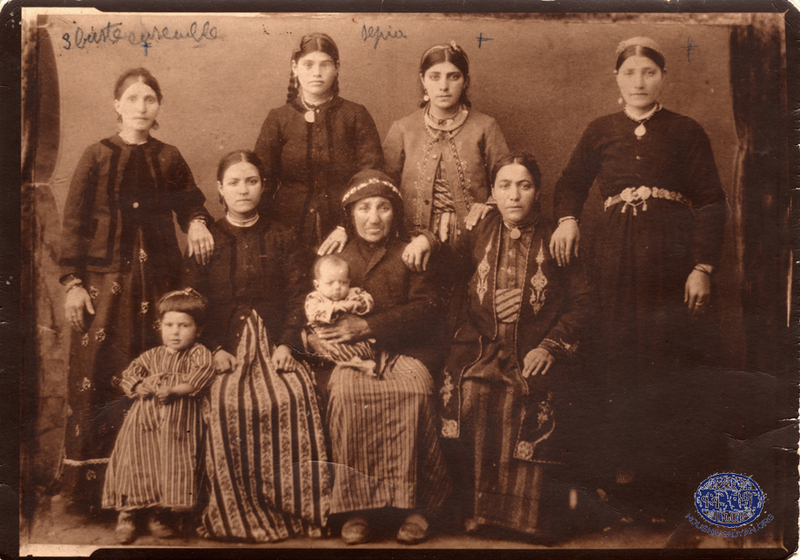 The 1894 Mamuretul Aziz provincial yearbook confirms Arotsig was entirely Armenian but that the population had significantly declined to 132 (60 males and 72 females) in 24 households. On the eve of the genocide, Armenian sources confirm the reduced population of 140 Armenians in 26 households. The 1834 Ottoman census detailed 242 Armenian males in 38 households and 68 Muslim males in 13 households. By the 1840 census, the Armenian male population had dropped to 204 in 40 households. The 1878 Armenian census noted an increased Armenian population of 611 in 70 households and 152 Turks living in the village. Eprigian supplies a population of 600 Armenians and 19 Turks in Arpavud. The 1894 Mamuretul Aziz provincial yearbook confirms the increased number of households. The population was stated to be 459 Armenians (265 males and 194 females) and 37 Muslims (17 males and 20 females) in 70 total households. However, the reduced Armenian population was largely attributable to the undercounting of women. The drop in the Muslim population must have been due to another cause though. On the eve of the genocide, the population had reduced to 343 Armenians in 52 households. Image from the 1834 Ottoman census: Village of Ashvan, the family of the priest Sarkis. He was the son of Haroutyun, also a priest. The old location of Ashvan is now under water. The new village of Muratcık is just south of the old village. Throughout the 19th century, most sources describe Ashvan as an entirely Armenian village, yet in 1834 15 Muslim men in 4 households were recorded. The 1834 Ottoman census also listed 441 Armenian males in 92 households while the 1840 census detailed 427 males in 94 households. The 1878 Armenian census stated the population had reduced to 611 Armenians in 58 households. Eprigian reported the Armenian population as 598. The 1894 Mamuretul Aziz provincial yearbook stated there were 457 Armenians (254 males and 203 females) in 84 households. Again, we see a much lower number of women than men which is indicative of a significant undercount. Yet, on the eve of the genocide the population had dropped to only 100 Armenians. In addition, Armenian sources indicate that by 1915 Ashvan contained 100 Kurds, 400 Turks and 120 Assyrians. Ayoub Baghi was a very small village with few Armenians in the 19th century. By the end of the century, there were no longer Armenians living in the village. The 1834 Ottoman census detailed 32 Armenian males in 7 households and 33 Muslim males in 8 households. By the 1840 census, already the population had dropped to 9 Armenian males in 4 households. The 1878 Armenian census stated there were only 21 Armenians living in 3 households and 90 Turks in Ayoub Baghi. Eprigian restated Ayoub Baghi contained 20 Armenians and 90 Turks. It is the last source that lists any Armenians living in Ayoub Baghi. The 1894 Mamuretul Aziz provincial yearbook stated the village as entirely Muslim with a reduced population of 39 (18 males and 21 females) living in 9 households. Today, only ruins appear to remain. There was some confusion over the location of Ayvoz. A map in Vahe Haig’s massive tome displayed Ayvoz as north of the city of Kharpert. Yet, other sources placed the village along the Euphrates River. 19th century travelers confirm the location as along the Euphrates. In addition, the village north of Kharpert was listed in the 1834 census as Obuz and did not contain Armenians. Ayvoz was not included with the Kharpert kaza in the early Ottoman census and thus far I have not located the village in another district. The 1878 Armenian census indicated 1001 Armenians in 120 households in the village along with 160 Assyrians and 152 Turks. Eprigian updated the Armenian population to 990 while retaining the Assyrian (160) and Turkish (152) populations. The 1894 Mamuretul Aziz provincial yearbook listed an upper and lower village with Armenians living in both. 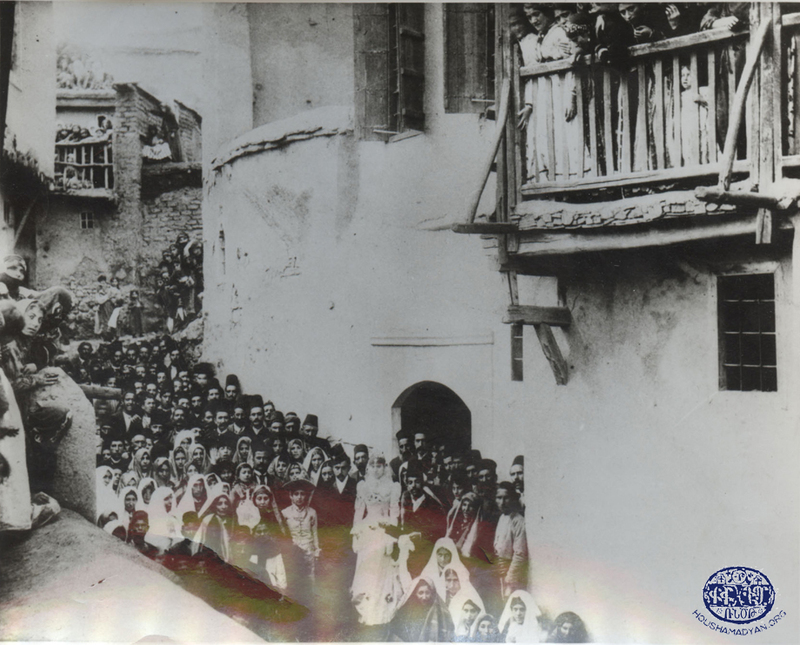 The population for the combined villages was 830 Armenians (442 males and 388 females) and 285 Muslims (147 males and 138 females) in 212 households. Interestingly, the yearbook does not indicate any Assyrians living in the village. Also, while the entire population shows an exceptionally high male to female ratio, the Armenian ratio is much higher indicating an even more significant undercounting of women. On the eve of the genocide, the Armenian population had been severely reduced to 250 in 28 households. Thus, it appears the Armenian population of Ayvoz was decimated by nearly 75% during and after the 1894-96 Hamidian massacres. Bazmashen was a significant entirely Armenian village. The 1834 Ottoman census detailed 617 males in 136 households while the number of males was 575 in 129 households in the 1840 census. The 1878 Armenian census indicated a much larger Armenian population of 1721 in 210 households. Eprigian stated Bazmashen had only a population of 1582. The 1894 Mamuretul Aziz provincial yearbook stated Bazmashen had 1706 Armenians (882 males and 824 females) in 245 households. Again, there was an undercounting of women, but still it is clear the village was prospering and growing. On the eve of the genocide, Bazmashen is reported to have contained 1450 Armenians in 320 households. It appears that emigration and the 1894-96 Hamidian massacres had taken a toll on the population. The small village of Chakle has been rarely discussed. The early non-Muslim census records do not list the village. However, the 1834 census register listed 41 Muslim males in 16 households. Neither 1878 Armenian census nor Eprigian mention the village. The 1894 Mamuretul Aziz provincial yearbook stated there were 13 Armenians (5 males and 8 females) and 56 Muslims (27 males and 29 females) in 14 households. On the eve of the genocide, only 17 Armenians lived in Chakle. It appears that Chakle is considered a hamlet of Har. The 1834 Ottoman census listed 138 Armenian males in 33 households and 50 Muslim males in 12 households in Chorkegh. Similarly, the 1840 census recorded 141 Armenian males in 33 households. The 1878 Armenian census indicated the village as entirely Armenian with a population of 381 in 60 households. The updated population in Eprigian was 369 Armenians. The 1894 Mamuretul Aziz provincial yearbook recorded a much lower population of 228 Armenians (125 males and 103 females) while also including 55 Muslims (29 males and 26 females) in 53 total households. On the eve of the genocide, the population had reduced to 160 Armenians in 25 households. Chotali was a mixed village and included a hamlet. The 1834 Ottoman census detailed 148 Armenian men in 27 households and 157 Muslim males in 40 households. The 1840 census recorded 137 Armenian men in 28 households. The 1878 Armenian census indicated a population of 261 Armenians in 40 households as well as 121 Turks. Eprigian recorded the population as 250 Armenians and 121 Turks. Which again appears to be an adjustment to the 1878 census for the Armenian population while retaining the Muslim population. The 1894 Mamuretul Aziz provincial yearbook stated the village contained 277 Armenians (133 males and 144 females) and 126 Muslims (62 males and 64 females) in 63 households. This confirms the drop in the Muslim population since 1834. On the eve of the genocide, the Armenian population had reduced to 25 households. While the number of Armenians was not stated, it most likely was between 150 and 200. The 1834 Ottoman census detailed 95 Armenian males in 23 households and 2 Muslim males in 2 households. Similarly, the 1840 census recorded 94 Armenian males in 25 households. The 1878 Armenian census stated the village contained 179 Armenians in 25 households and 184 Turks. Here again Eprigian adjusts the Armenian population from the 1878 census yet leaves the Muslim population unchanged. He stated the Armenian population was 168 and that the village also had 184 Turks. 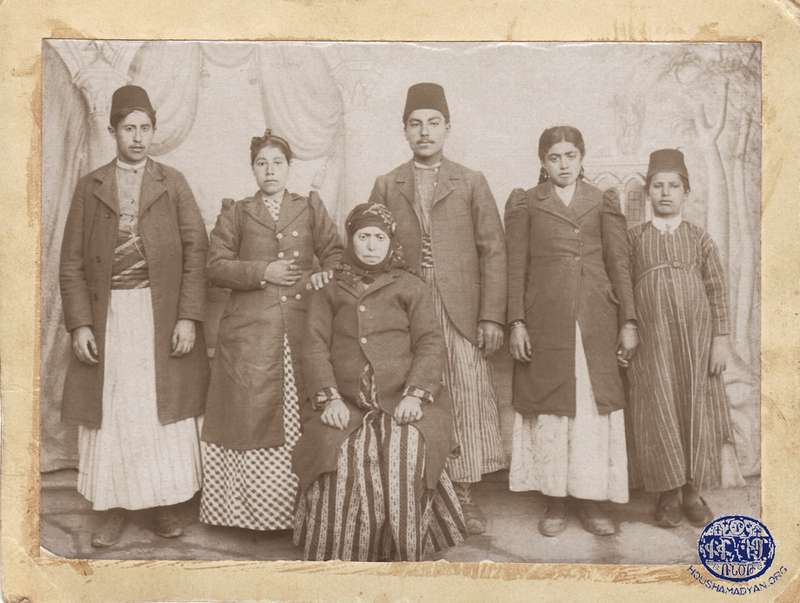 The 1894 Mamuretul Aziz provincial yearbook stated there were 136 Armenians (60 males and 76 females) and 2 Muslims (1 male and 1 female) in 31 households. The number of Armenian males seems suspiciously low. However, the major inconsistency was with the number of Muslims. It is inconceivable that the Muslim population could go from 2 in 1834 to 184 in 1878 and then back to 2 in 1894. On the eve of the genocide, there were 131 Armenians in 19 households. Image from the 1834 Ottoman census: Village of Dzovk, the family of Asadour, the priest, who was the son of Asadour also a priest. Today, there is a small cluster of houses essentially at the old location of Dzovk. It appears to be identified as the Göl neighborhood of the village of Sürek. The monastery of Sp. Nshan is now underwater with only the top portions of the walls exposed. In the past, the monastery had variously existed on an island or a peninsula depending on the water level of the lake. The 1834 Ottoman census detailed 256 Armenians in 58 households. The village was not listed in the 1840 census for the Kharpert kaza. One reason could be that the village had been temporarily flooded and, thus, a census could not be performed. The 1878 Armenian census indicated the village was entirely Armenian with a population of 517 in 60 households. Eprigian updated the Armenian population to 496. The 1894 Mamuretul Aziz provincial yearbook confirms the village was entirely Armenian with a population of 459 (235 males and 224 females) in 119 households. This implied a slightly low population per household. On the eve of the genocide, the village still contained 93 Armenian households. Most likely the population of Dzovk was still between 475 and 525. The 1834 Ottoman census recorded 71 Armenian males in 16 households. Similarly, the 1840 census detailed 63 males in 15 households. The 1878 Armenian census stated the population was 115 Armenians in 18 households with no Muslims in Elimlig. Eprigian also indicated a population of 100 Armenians. The 1894 Mamuretul Aziz provincial yearbook stated there were 109 Armenians (49 males and 60 females) and 27 Muslims (11 males and 16 females) in 37 households. Again, this implies a slightly low population per household. On the eve of the genocide, the population had further declined to 86 Armenians in 13 households. The 1834 Ottoman census detailed 47 Armenian males in 11 households and 100 Muslim males in 38 households in Erzroug. In 1840, the census listed 51 Armenian males in 15 households. By the 1878 Armenian census, the population had grown to 191 Armenians in 30 households along with 100 Turks. Eprigian supplied a population of 181 Armenians and 101 Turks. The 1894 Mamuretul Aziz yearbook stated there were only 104 Armenians (59 males and 45 females) and 86 Muslims (42 males and 44 females) in 53 households. The implied population per household seems very low. On the eve of the genocide, there no longer were any Armenians recorded as living in Erzroug. The cover of Father Eprigian’s book and a page from the book showing the statistics on Harput/Kharpert. Ganepig was a majority Muslim village. The 1834 Ottoman census detailed 77 Armenian males in 18 households and 133 Muslim males in 32 households. The 1840 census recorded a decline to 44 Armenian males in 13 households. The 1878 Armenian census recorded an increase to 133 Armenians in 20 households as well as 324 Turks in Ganepig. Eprigian stated the population as 130 Armenians and 324 Turks, again adjusting the Armenian population while leaving the Muslim population as recorded in the 1878 Armenian census. The 1894 Mamuretul Aziz provincial yearbook stated there were 63 Armenians (42 males and 21 females) and 472 Muslims (211 males and 261 females) in 86 total households. It is surprising that the Armenian males number twice the females while Muslim males appear to be significantly undercounted. 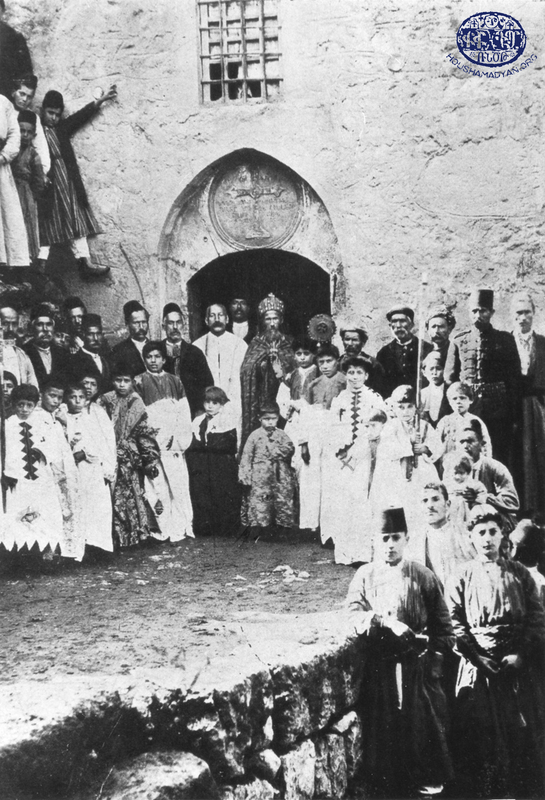 Given the reported decline in the Armenian population, one could speculate that a number of Armenians had converted to Islam, either forcibly or voluntarily, or were at least living as Muslims due to marriage. On the eve of the genocide, the village no longer contained a recorded Armenian population. Garmri was a large mixed village. While Teotig lists the church name as Sp. Lusavorich, the correct name was Sp. Toros. The 1834 Ottoman census listed 309 Armenian males in 86 households and 341 Muslims in 129 households. The 1840 census recorded 299 Armenian males in 89 households. The 1878 Armenian census indicated 651 Armenians lived in 90 households along with 594 Turks. Eprigian reported an updated Armenian population of 610 while retaining the Turkish population of 594 as reported in the 1878 Armenian census. The 1894 Mamuretul Aziz yearbook recorded a decline in the population of Garmri to 552 Armenians (284 males and 268 females) and 540 Muslims (274 males and 266 females) in 239 households. On the eve of the genocide, the village still had 533 Armenians in 85 households. Habousi (present-day Ikizdemir), Kasabian family. Standing (from left): Hagop Garoyan, Malkhas Kasabian, Ester Garoyan (later Hagopian), Marta Kasabian, and Sultan Kasabian (wife of Malkhas). The boy standing directly in front is Garabed Kasabian. 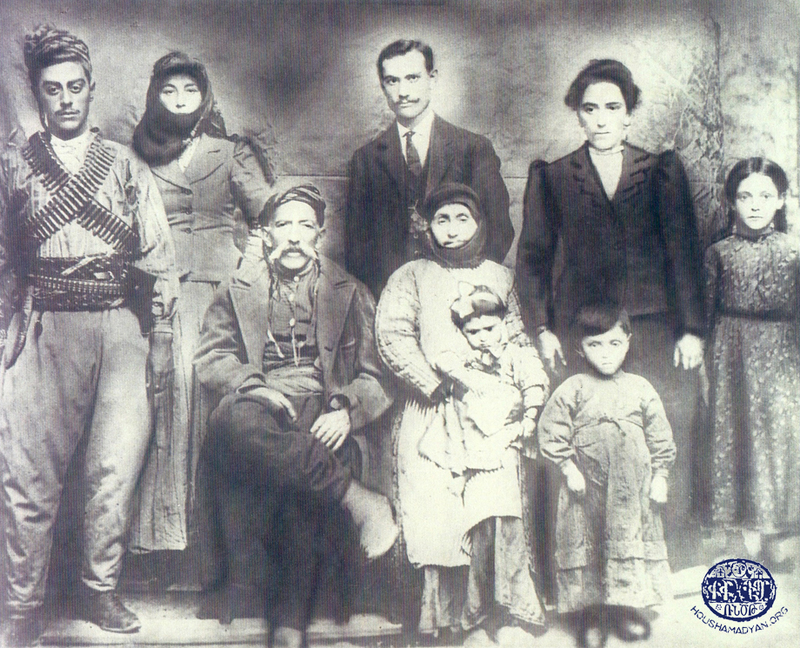 Seated (from left): Trfanda Kasabian, Karekin Kasabian (father of Malkhas), Mariam Kasabian (wife of Karekin and mother of Malkhas), and Aram Kasabian (little boy standing between Karekin and Mariam). Marta, Garabed, Trfanda and Aram are the children of Malkhas and Sultan (Source: Vera Avedisian-Garabedian collection, New Hampshire). Habousi was a large, entirely Armenian village. The village is now under the waters of the Keban reservoir. A page is missing from the 1834 Ottoman census. I have determined that the missing page contains the end of the listings for Munzur-oghlou and the start of the families from Habousi. 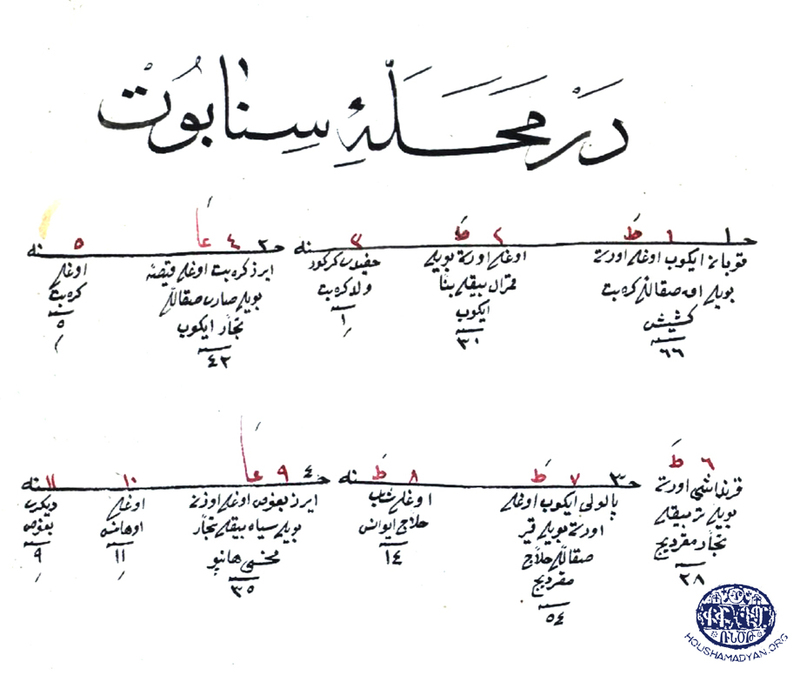 Since neither the individuals nor the households are numbered, it is not possible to determine how many are contained on the missing page nor how they would be split between Habousi and Munzur-oghlou. However, based on the known information, I have attempted to estimate those contained on the missing page. Thus, I estimate 673 Armenian males in 134 households were recorded in the 1834 Ottoman census. The 1840 census detailed 668 Armenian males in 142 households. The 1878 Armenian census indicated the village continued to grow and prosper with a population of 1221 Armenians in 180 households. Eprigian updated the Armenian population to 1100. The 1894 Mamuretul Aziz provincial yearbook recorded a higher population of 1299 Armenians (696 males and 603 females) in 186 households. The undercounting of the women indicates the village likely had more than 1400 Armenians. Thus, the village was continuing to grow up until the Hamidian massacres. On the eve of the genocide there were 1200 Armenians in 180 households. The 1834 Ottoman census detailed 37 Armenian males in 8 households and 99 Muslims in 34 households. While the 1840 census indicated an increase to 42 Armenian males in 9 households. The village continued to grow and the 1878 Armenian census stated the population was 123 Armenians in 18 households along with 152 Turks. Once again, Eprigian adjusted the population to 120 Armenians while retaining the 152 Turks of the 1878 Armenian census. The 1894 Mamuretul Aziz provincial yearbook showed a population of 90 Armenians (49 males and 41 females) and 238 Muslims (118 males and 120 females) in 69 households. On the eve of the genocide, the Armenian population had continued its rapid decline to only 45 in 13 households. The 1834 Ottoman census listed 85 Armenian males in 28 households and 122 Muslim males in 35 households in the village of Harsenk. The 1840 census only listed 71 Armenian males in 20 households. The 1878 Armenian census recorded an increase to 211 Armenians in 37 households with 260 Turks. Eprigian adjusts the Armenian population to 200 while retaining the 1878 Armenian census figure for Muslims at 260. The 1894 Mamuretul Aziz provincial yearbook stated the population was 205 Armenians (112 males and 93 females) and 173 Muslims (95 males and 78 females) in 74 total households. It is interesting that the Muslim population of Harsenk registered such a significant drop between the 1878 Armenian census and the 1894 Ottoman source. On the eve of the genocide, 192 Armenians in 32 households still remained in Harsenk. The Armenian population of Havoug was detailed in the 1834 Ottoman census as 73 males in 15 households while slightly smaller with 66 males in 13 households in the 1840 census. The 1878 Armenian census also showed a decline to 101 Armenians in 18 households along with 36 Turks. Eprigian adjusted the Armenian population to 97 while retaining the population of Turks at 36. The 1894 Mamuretul Aziz provincial yearbook recorded a population of 61 Armenians (32 males and 29 females) and 91 Muslims (59 males and 32 females) in 28 households. The Armenian population of Havoug continued its decline while the Muslim population was increasing. On the eve of the genocide, no Armenian population was recorded in the village. Hnstor is an interesting village with confusing population figures. I could not find reference to the village in the 1834 census. In the 1840 Ottoman census, only 10 Armenian males in 3 households were recorded. Neither the 1878 Armenian census nor Eprigian mention Hntsor. The 1894 Mamuretul Aziz yearbook stated Hnstor as entirely Muslim with a population of 269 in 64 households. Yet, on the eve of the genocide, Hnstor contained 130 Armenians in 25 households. Thus, if the figures are accurate, Hnstor grew substantially over the last 20 years of the Ottoman empire after having lost its initial Armenian population prior to 1878. Yet, it still seems unlikely that the village contained Armenians in 1840 and in 1915, yet none in the intervening years. Hoghe was a large mixed village. The 1834 Ottoman census listed 478 Armenian males in 104 households and 307 Muslim males in 107 households. The 1840 census also listed 478 Armenian men in 132 households. The 1878 Armenian census stated the population of Hoghe as 1186 Armenians in 178 households as well as 530 Turks. Eprigian reduced the Armenian population to 1046 while restating the Turkish population as 530. The 1894 Mamuretul Aziz yearbook stated the population as 1179 Armenians (618 males and 561 females) and 605 Muslims (296 males and 309 females) in 333 total households. Again, the number of Armenian women is suspiciously low, most likely an indication that over 1200 Armenians were living in Hoghe. On the eve of the genocide, the Armenian population had grown to 1540 in 190 households. Husenig was a significant, majority Armenian town in the shadows of the Kharpert fortress. The town is missing from the non-Muslim register from the 1834 Ottoman census. The Muslim register listed 313 Muslim males in 104 households. The 1840 census detailed 776 Armenian males in 233 households. The 1878 Armenian census registered a significant increase in the population to 2460 Armenians in 418 households along with 632 Turks. Eprigian further adjusted the Armenian population to 2826 while retaining the Turkish population at 632. The 1894 Mamuretul Aziz provincial yearbook stated the population was 2836 Armenians (1476 males and 1360 females) and 671 Muslims (330 males and 341 females) in 866 total households. The town continued to grow rapidly and on the eve of the genocide there were 6090 Armenians in 750 households. Such a significant increase over a short time period would seem only possible from an influx of new arrivals. It is possible that following the Hamidian massacres, a large number of Armenian families migrated to Husenig in hopes of greater security. Ichme was an important mixed village on the route between Kharpert and Palu. The 1834 Ottoman census listed 468 Armenian men in 100 households. I did not find it referenced in the Muslim register. The 1840 census recorded 441 Armenian men in 120 households. The 1878 Armenian census stated the population of Ichme to be 1121 Armenians in 160 households and 422 Turks. Eprigian updated the Armenian population to 1004 while leaving the Turkish population at 422. The 1894 Mamuretul Aziz yearbook stated the population to be 1038 Armenians (569 males and 469 females) and 398 Muslims (210 males and 188 females) in 284 total households. Women were undercounted and thus most likely the Armenian population was still over 1100 and the Muslim population over 400. Following the Hamidian massacres, the Armenian population reduced significantly and on the eve of the genocide there only remained 589 Armenians in 60 households. Ipil has been known also as the hamlet of Hagop. The population was always small on the outskirts of Dzarug. The 1834 Ottoman census listed 28 Armenian men in 7 households. This number increased to 48 Armenian men in 7 households in the 1840 census. 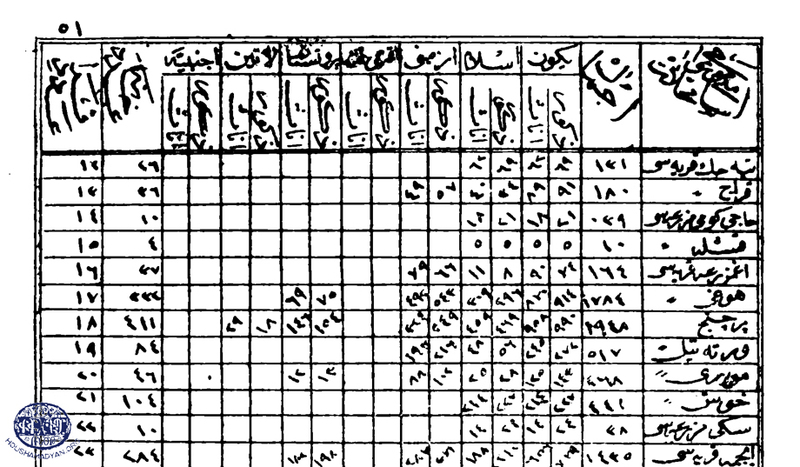 The 1834 census also listed 12 Muslim men in 2 households, one of which was identified as Ibil oghlou. Interestingly, the 1834 non-Muslim register listed the village as Ibil oghlou mezre while the Muslim register lists it as Hagop mezre. The 1840 non-Muslim register listed the village also as Hagop mezre, confirming that it is the same location. The 1878 Armenian census stated the population was 75 Armenians in 11 households and 16 Turks. Eprigian reduced the Armenian population to 70 and retained the Turkish population at 16. 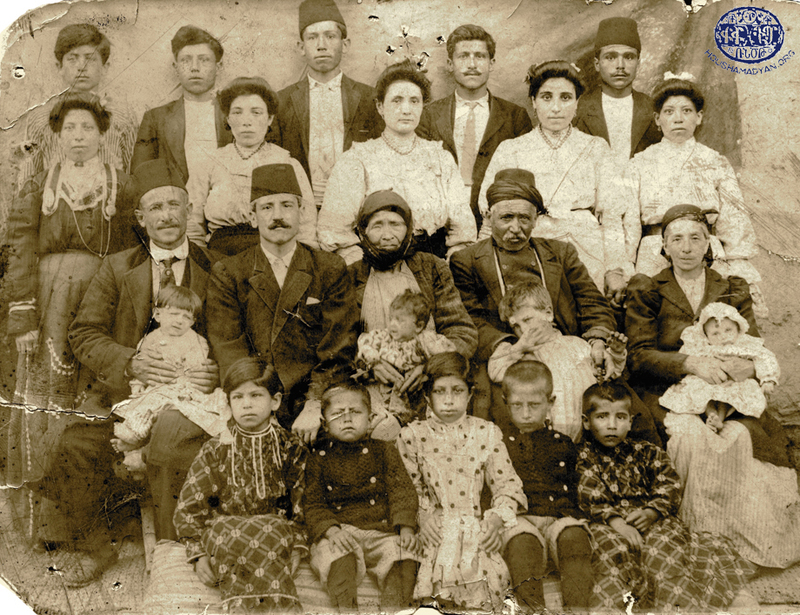 The 1894 Mamuretul Aziz provincial yearbook stated the population was 42 Armenians (21 males and 21 females) and 40 Muslims (20 males and 20 females) in 16 households. Thereafter, sources do not indicate an Armenian population in the village. Karungerd is missing from the non-Muslim register for the 1834 Ottoman census, however the 1840 register listed 173 Armenian males in 46 households. The 1834 Muslim register listed 10 Muslim males in 3 households. The 1878 Armenian census stated the village was entirely Armenian with a population of 301 in 32 households. Eprigian updated the population to 281 Armenians. 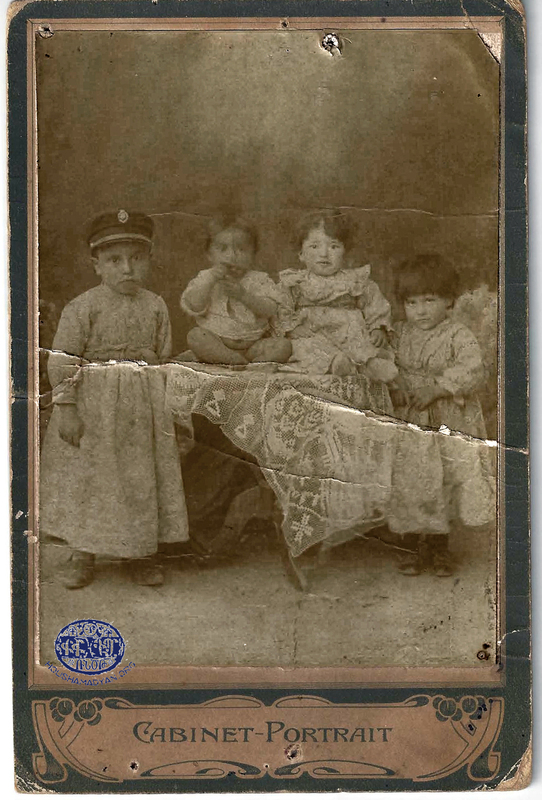 The 1894 Mamuretul Aziz yearbook also confirmed the village had become entirely Armenian with a population of 232 (114 males and 118 females) in 50 households. The village continued to decline and on the eve of the genocide contained 95 Armenians in 25 households. Teotig stated the village had an Armenian population of 760 in 150 households. It would seem probable that they are for another village, though, if so, it is not clear to me which village. Regardless, Teotig’s figures were likely in error for Karungerd. The 1834 Ottoman census listed 128 Armenian males in 26 households and 49 Muslim males in 16 households. The 1840 census listed 115 Armenian males in 32 households. The 1878 Armenian census stated the population of Kaylu to be 201 Armenians in 30 households as well as 130 Turks. Eprigian reduced the Armenian population to 188 while retaining the Turkish population at 130. The 1894 Mamuretul Aziz yearbook indicated the population declined further to 136 Armenians (51 males and 85 females) and 105 Muslims (59 males and 46 females) in 86 households. However, the implied population per household is extremely low, possibly indicating undercounting or a mistake in the number of households. On the eve of the genocide, 156 Armenians in 27 households lived in Kaylu. Kegh Vank was a large mixed village, yet I could not find the listing of Muslims in the 1834 Ottoman census. There were 230 Armenian men in 50 households listed in the 1834 census and 229 Armenian males in 65 households in the 1840 census. The 1878 Armenian census stated the population to be 301 Armenians in 38 households as well as 400 Turks. Eprigian stated the Armenian population to be 292 while retaining the Turkish population of 400. The 1894 Mamuretul Aziz yearbook reduced the population to 266 Armenians (135 males and 131 females) and 380 Muslims (190 males and 190 females) in 146 total households. On the eve of the genocide, only 108 Armenians in 26 households remained. The statistics indicate that throughout the time period Kegh Vank had lost over 75% of the its Armenian population. Keserig was a large mixed village. It is missing from the 1834 Ottoman census for non-Muslims, but contained 251 Muslim males in 87 households. The 1840 census listed 757 Armenian males in 197 households. The 1878 Armenian census stated the population of Keserig to be 2511 Armenians in 314 households and 770 Turks. The town was growing rapidly and both sources indicated the town was approximately 75% Armenian. Eprigian reduced the Armenian population to 2345 while retaining the Turkish population of 770. The 1894 Mamuretul Aziz yearbook stated the population to be 1829 Armenians (944 males and 885 females) and 915 Muslims (496 males and 419 females) in 533 households. It is clear that women were undercounted, but the Armenian population was declining while the Muslim population was increasing. On the eve of the genocide, there were 2280 Armenians in 380 households. One can speculate that population growth was restricted by emigration and the Hamidian massacres while supplemented by new settlers in the village. The 1878 Armenian census and Eprigian seem to only represent the Muslim male population even though it was indicated to be the total Muslim population. Unlike for the Armenian population, the 1871 Diyarbakir yearbook supplies a more reasonable value for Muslim males. Again, the 1881 Mamuretul Aziz yearbook figure seems to low. Thus, the data implies the Armenian population constituted around 33% of the total population of Kharpert city. Kharpert was made up of 21 neighborhoods of which 6 contained Armenians, 5 purely Armenian. The Armenian portion of Kharpert is in ruins. Today, no one lives in these areas. 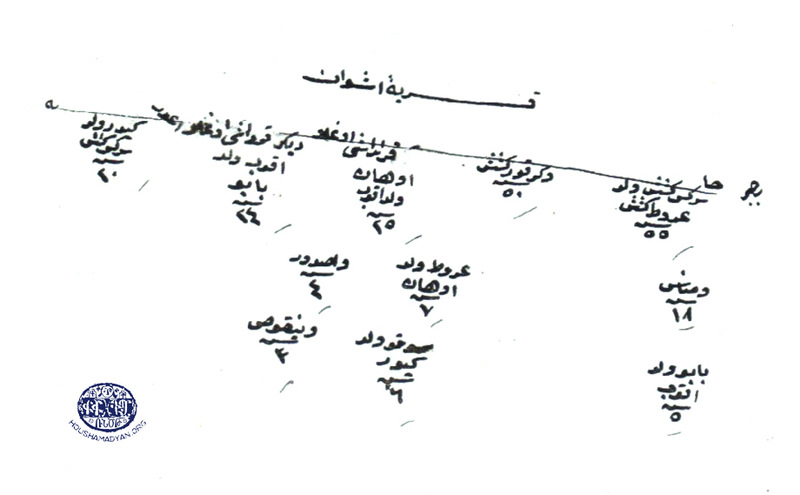 An image from the 1840 Ottoman census for the Sinamut [Sinabut] neighborhood of Harput/Kharpert. The 1834 census listed 52 Armenian males in 11 households and 119 Muslim males in 34 households in Varin Khokh. The 1840 census detailed 44 Armenian males in 13 households in the village. The 1878 Armenian census stated Varin Khokh contained 91 Armenians in 15 households as well as 392 Turks. Eprigian stated the Armenian population was 88 while retaining the Turkish population at 392. The 1894 Mamuretul Aziz yearbook stated the village contained 69 Armenians (39 males and 30 females) and 486 Muslims (232 males and 254 females) in 112 total households. Thus, we see the Armenian population in decline while the Muslim population was increasing. On the eve of the genocide, Armenians were no longer recorded as living in Varin Khokh. The 1834 census lists 558 Armenian males in 133 households and 444 Muslim males in 152 households in Verin Khokh. The 1840 census detailed 506 Armenian males in 143 households in Verin Khokh. The 1878 Armenian census detailed 911 Armenians in 140 households and 556 Turks. Eprigian reduced the Armenian population to 800 while retaining the Turkish population at 556. The 1894 Mamuretul Aziz yearbook stated the population was 812 Armenians (441 males and 371 females) and 635 Muslims (330 males and 305 females) in 328 households. The Armenian women appear to have been substantially undercounted. Both Khokh villages were decimated during the Hamidian massacres. On the eve of the genocide, the Armenian population of Verin Khokh had been reduced to only 300 in 45 households. Khoulakyugh was an entirely Armenian village. The 1834 Ottoman census detailed 493 Armenian males in 99 households. The 1840 census listed 416 Armenians in 98 households. A portion of these men were living at the monastery (6 in 1834 and 8 in 1840). The 1878 Armenian census stated the village had grown to 1302 Armenians in 200 households. Eprigian updated the population to 1346 Armenians. The 1894 Mamuretul Aziz yearbook stated the population was 1037 Armenians (550 males and 487 females) in 104 households. Again we see substantially more males reported than females. In addition, the number of households seems low. On the eve of the genocide, there were 1201 Armenians in 240 households in Khoulakyugh. The 1834 Ottoman census listed 178 Armenian males in 39 households and 66 Muslim males in 17 households. The 1840 census listed 154 Armenian males in 49 households. The 1878 Armenian census stated Khouradj had 203 Armenians in 38 households and 44 Turks. Eprigian reduced the Armenian population further to 188, but left the Turkish population at 44. 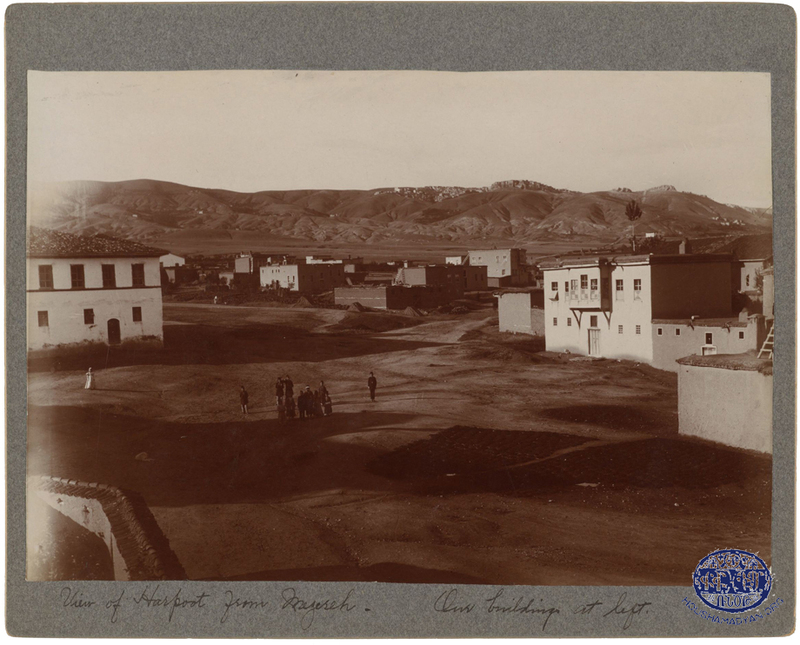 The 1894 Mamuretul Aziz yearbook stated the population of Khouradj was 106 Armenians (57 males and 49 females) and 74 Muslims (34 males and 40 females) in 36 total households. The village was in decline. On the eve of the genocide, only an Armenian household count of 10 was reported. That implied an Armenian population of between 50 and 75, maybe 15% of the 1834 peak. Khurbet mezre was a small hamlet. The 1834 Ottoman census listed 26 Armenian men in 5 households and 55 Muslim men in 17 households. The 1840 census detailed 19 Armenian men in 5 households. The 1878 Armenian census stated the population of Khurbet mezre as 49 Armenians and 50 Turks. Eprigian stated the Armenian population as 43 while retaining the Turkish population of 50. The 1894 Mamuretul Aziz yearbook stated the population as 49 Armenians (26 males and 23 females) and 94 Muslims (51 males and 43 females) in 37 total households. On the eve of the genocide, only 20 Armenians in 4 households were recorded as living in the village. Khurkhig is missing from the non-Muslim register of the 1834 Ottoman census. The Muslim register listed 71 males in 26 households. The 1840 census listed 26 Armenian males in 9 households. The 1878 Armenian census stated the population was 65 Armenians in 10 households and 154 Turks. Thus, Khurkhig had remained a small, Muslim majority village. Eprigian stated the population was 62 Armenians and 154 Turks. The 1894 Mamuretul Aziz yearbook only detailed 14 Armenians (7 males and 7 females) in Khurkhig along with 127 Muslims (58 males and 69 females) in 28 total households. The number of Armenians seems suspiciously low, implying 80% of the Armenians had left the village. On the eve of the genocide, Teotig stated there were 70 Armenian households in Khurkhig. This seems equally unlikely and most likely it was meant to be 70 Armenians, not households. Thus, I believe it more likely that 10 Armenian families lived in the village throughout the period, as opposed to 8 families leaving and either returning or being replaced by a new group of 8 families. 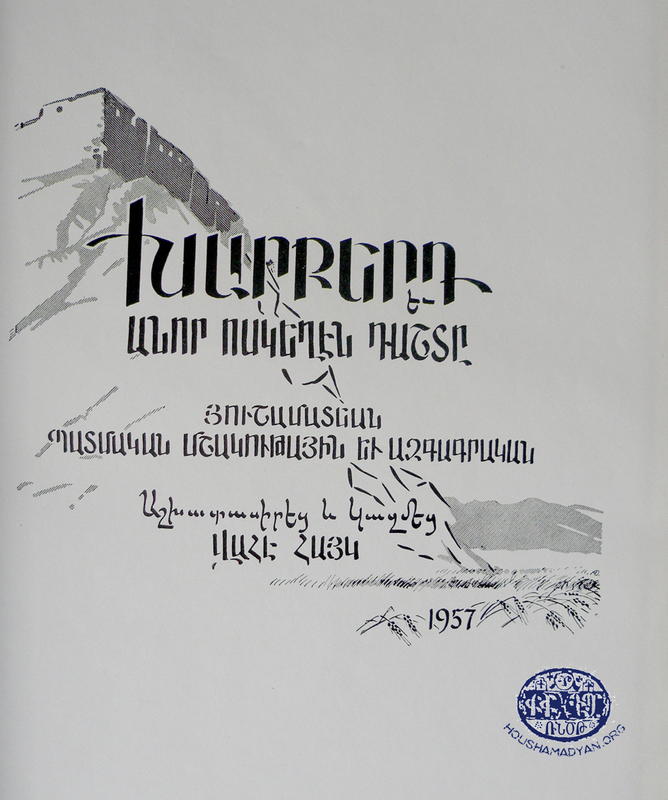 Cover picture: Vahé Haig, Խարբերդ եւ անոր ոսկեղէն դաշտը [Kharpert and its Golden Plain], 1959, New York. Khouylou was a large, almost entirely Armenian village. The 1834 Ottoman census listed 902 Armenian males in 207 households. I did not find Khouylou listed in the Muslim register. The 1840 census listed 898 Armenian males in 205 households. The 1878 Armenian census stated the population was 2011 Armenians in 279 households and 39 Turks. Eprigian stated the population was 2066 Armenians and 39 Turks. The 1894 Mamuretul Aziz yearbook stated the population was 1527 Armenians (701 males and 826 females) and 95 Muslims (57 males and 38 females) in 348 households. The disparity between the number of Armenian men and women seems suspect. Yet, on the eve of the genocide, the population of Khouylou had declined to 1278 Armenians in 220 households. Komk was an entirely Armenian village. The 1834 Ottoman census listed 428 Armenian males in 85 households. The 1840 census also listed 428 Armenian males but in 105 households. The 1878 Armenian census stated the population as 1111 Armenians in 190 households. Eprigian stated the population as 1011 Armenians. The 1894 Mamuretul Aziz yearbook stated only 792 Armenians (412 males and 380 females). The number of households was listed as only 2 and is clearly a mistake. The village continued to decline and, on the eve of the genocide, contained 663 Armenians in 110 households. The original village of Komk was then largely flooded by the Keban reservoir and those few that remain now live slightly south of the old location. Konak Almaz is missing from the 1834 Ottoman census. The 1840 census listed 108 Armenian males in 29 households. The 1878 Armenian census stated the population to be 245 Armenians in 34 households and 78 Turks. Eprigian stated the population to be 240 Armenians and 78 Turks. The 1894 Mamuretul Aziz yearbook stated the population had declined to 126 Armenians (76 males and 50 females) and 60 Muslims (28 males and 32 females) in 31 households. Again, it appears the Armenian women were undercounted. On the eve of the genocide, Konak Almaz contained 149 Armenians in 22 households. Korpe was another entirely Armenian village. The 1834 Ottoman census listed 498 Armenian males in 92 households while the 1840 census listed 455 Armenian males in 86 households. The 1878 Armenian census detailed an increase in the population to 1255 Armenians in 175 households. Eprigian stated the population was 1055 Armenians. The 1894 Mamuretul Aziz yearbook stated the population was 932 Armenians (492 males and 440 females) in 149 households. Once again, it would appear that the Armenian women were undercounted. On the eve of the genocide, there were 570 Armenians in 102 households. The village suffered substantially during the Hamidian massacres. Shapuhian (History of Korpe or Körpe Village) listed individually 741 Armenians in 127 households. 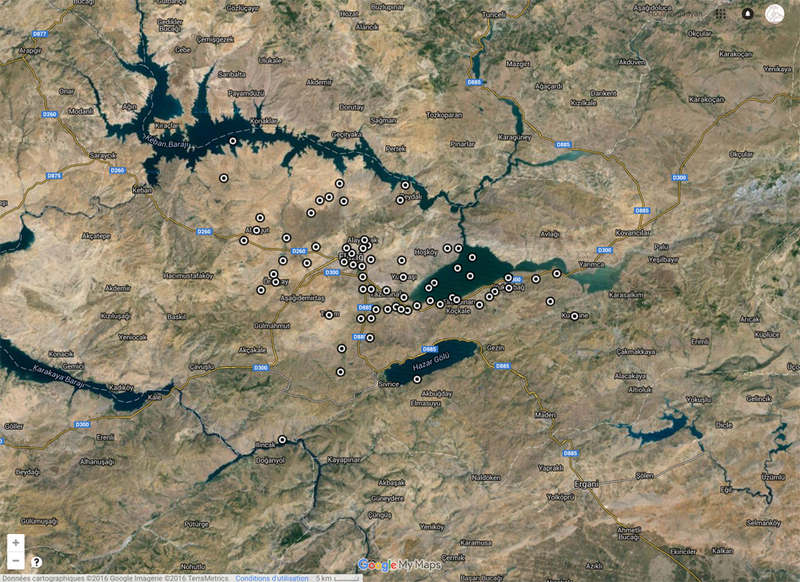 Well over 100 were listed as living elsewhere, America, other villages in Kharpert, the Turkish army, etc. 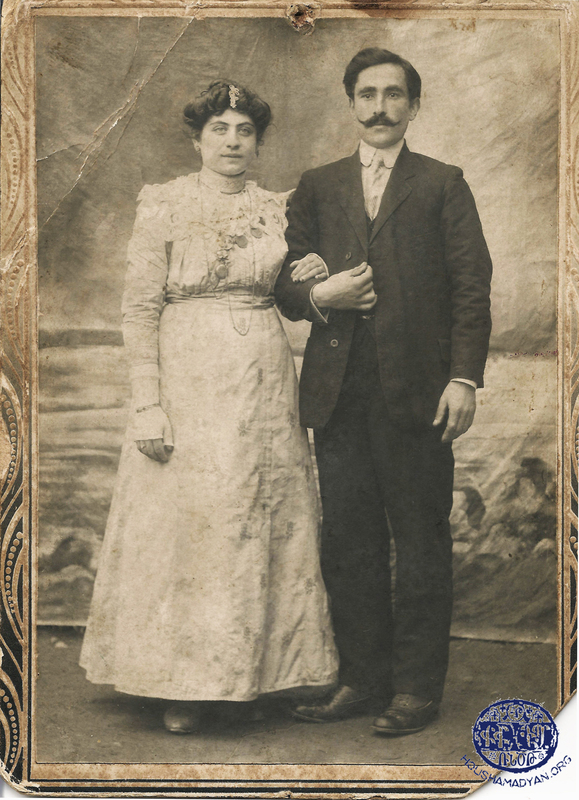 Verin Mezire, ca 1913, the wedding photo of Aristakes Hagopian and his wife (name unknown) (Source: Ida Ceccaldi-Der Haroutunian collection, Marseilles). Again we see rapid growth, achievable only through population movement, and an unreasonably low figure in the 1881 Mamuretul Aziz yearbook. On the eve of the genocide, the population of Mezire had not yet exceeded that of Kharpert city, though it was quickly approaching. 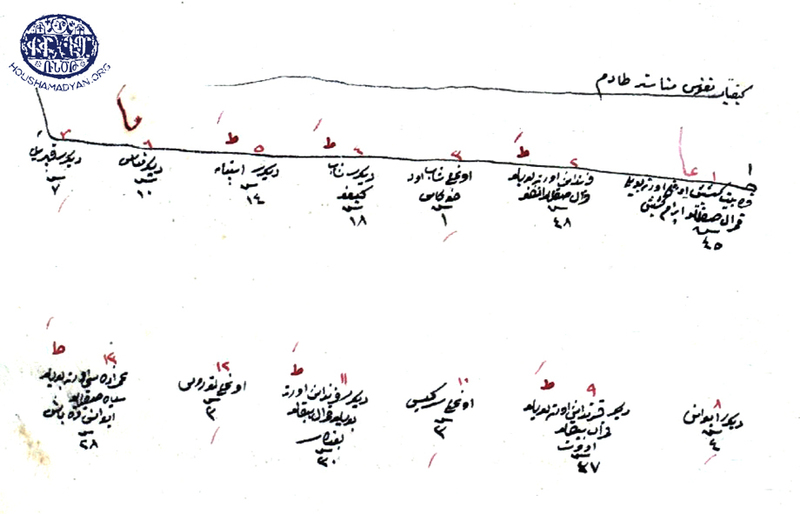 Early Ottoman census records indicate Armenians lived in Mollakendi. The 1834 census listed 24 Armenian males in 6 households while the 1840 census listed 23 males in 12 households. I did not locate Mollakendi in the 1834 Muslim register. The 1878 Armenian census stated only 8 Armenians lived in 2 households in Mollakendi along with 514 Turks. Eprigian repeated these figures. Thereafter, the village was reported to be entirely Muslim. The 1894 Mamuretul Aziz yearbook stated the population as 444 Muslims (221 males and 223 females) in 61 households. Morenig was a large, almost entirely Armenian village. While the village is missing from the 1834 Ottoman census, the 1840 census listed 204 Armenian males in 72 households. The 1878 Armenian census registered a significant growth in the Armenian population to 811 in 97 households along with 21 Turks. Eprigian does not mention any Turks living in Morenig and stated the Armenian population was 818. The 1894 Mamuretul Aziz yearbook stated the population was 677 Armenians (352 males and 325 females) and 15 Muslims (8 males and 7 females) in 124 total households. On the eve of the genocide, there remained 660 Armenians in 127 households in Morenig. The 1834 Ottoman census listed 132 Armenian males in 32 households and 25 Muslim males in 9 households. The 1840 census listed 119 Armenian males in 36 households. The 1878 Armenian census recorded 301 Armenians in 57 households and 48 Turks. Eprigian stated the population was 285 Armenians and 48 Turks. The 1894 Mamuretul Aziz yearbook stated the population of Mouri to be 215 Armenians (115 males and 100 females) and 53 Muslims (28 males and 25 females) in 46 total households. On the eve of the genocide, only 200 Armenians in 31 households remained. Munzur oghli was an entirely Armenian village. It is now under the waters of the Keban reservoir. As with Habousi, there is a page missing from the 1834 Ottoman census. I have estimated the recorded population to be 233 Armenian males in 40 households. The 1840 census listed 260 Armenian males in 47 households. The 1878 Armenian census recorded the population to be 511 Armenians in 79 households. Eprigian stated the Armenian population was 499. The 1894 Mamuretul Aziz yearbook stated the population of Munzur oghli to be 443 Armenians (227 males and 216 females) in 57 households. On the eve of the genocide, the population had been reduced to 250 Armenians in 40 households. Nekereg was a small, Armenian-majority village. I could not identify the village in the Muslim register, but the 1834 Ottoman census listed 192 Armenian males in 40 households. The 1840 census listed 166 Armenian males in 37 households. The 1878 Armenian census indicated a further decline in the Armenian population to 239 Armenians in 42 households along with 32 Turks. Eprigian stated the population of Nekereg was 229 Armenians and 32 Turks. The 1894 Mamuretul Aziz yearbook stated the population was 281 Armenians (158 males and 123 females) and 114 Muslims (57 males and 57 females) in 76 total households. On the eve of the genocide, Nekereg had 228 Armenians in 40 households. The plan for a two-story building in Parchandj. The house belonged to an Armenian family bearing the surname Khodjgants. The plan was printed in Manoog Dzeron’s book. It was prepared by the author himself, and then redrawn by his son, Levon Dzeron. The version presented on this page was reworked by Houshamadyan. We have tried to maintain the authenticity of the original, while giving it a visually more appealing look to this amazing document. Parchandj was a large mixed village. The 1834 Ottoman census listed 404 Armenian males in 95 households and 478 Muslims in 173 households. The 1840 census recorded 368 Armenian males in 97 households. The 1878 Armenian census stated the population was 1319 Armenians in 220 households and 1006 Muslims. Eprigian stated the population was 1267 Armenians and 1006 Turks. The 1894 Mamuretul Aziz yearbook stated the population was 973 Armenians (503 males and 470 females) and 928 Muslims (469 males and 459 females) in 417 total households. On the eve of the genocide, 681 Armenians in 180 households were reported living in Parchandj. However, the population per household seems unreasonably low. Saray is a small neighborhood near Husenig. The village was not listed in the non-Muslim register of the 1834 or 1840 Ottoman census. In the Muslim register of the 1834 Ottoman census, Saray is listed with 42 males in 13 households. The 1878 Armenian census stated the village had 90 Armenians in 14 households along with 120 Turks. Eprigian adjusted the Armenian population to 81 and restated the Turkish population as 120. The 1894 Mamuretul Aziz yearbook stated the population was 121 Armenians (61 males and 60 females) and 135 Muslims (62 males and 73 females) in 52 total households. On the eve of the genocide, 16 Armenian households still remained. While a population was not stated, there was most likely between 80 and 125 Armenians. Sarekamish was a majority Armenian village. The 1834 Ottoman census listed 251 Armenian males in 59 households and 27 Muslim males in 8 households. The 1840 census listed 239 Armenian males in 57 households. The 1878 Armenian census stated the population was 535 Armenians in 80 households and 314 Turks. Eprigian stated the population was 525 Armenians and 314 Turks. The 1894 Mamuretul Aziz yearbook registered a population decline to 396 Armenians (207 males and 189 females) and 122 Muslims (62 males and 60 females) in 110 total households. On the eve of the genocide, the Armenian population declined further to 346 in 58 households. The small village of Sarptsik was not listed in all sources. The 1834 Ottoman census listed 68 Armenian males in 10 households. I did not find Sarptsik listed in the Muslim register. The 1840 census listed 59 Armenian males in 10 households. Sarptsik was not listed in the 1878 Armenian census or in Eprigian. The 1894 Mamuretul Aziz yearbook stated the population was 108 Armenians (55 males and 53 females) and 302 Muslims (150 males and 152 females) in 84 households. On the eve of the genocide, there were 149 Armenians in 16 households. Shemshi was an entirely Armenian village. The location of Shemsi is now under the Keban reservoir. The 1834 Ottoman census listed 197 Armenian males in 44 households while the 1840 census detailed 198 males in 54 households. 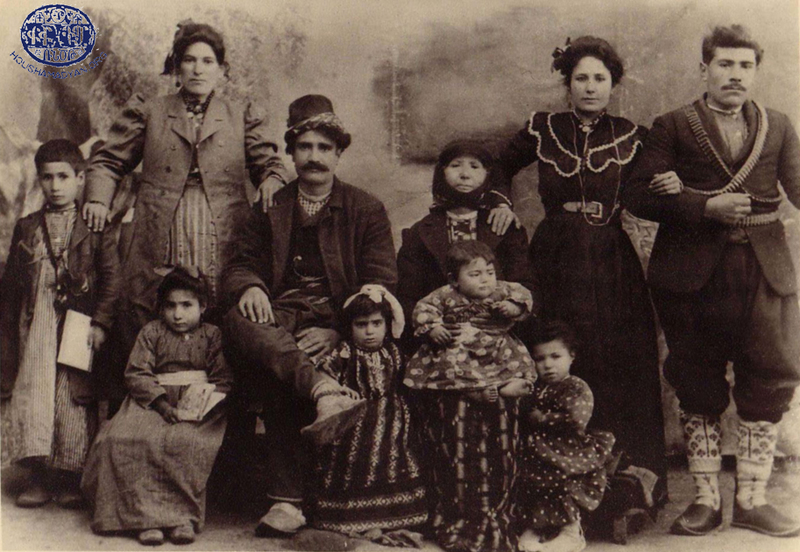 The 1878 Armenian census stated the population of Shemshi was 321 Armenians in 48 households. Eprigian updated the Armenian population to 303. 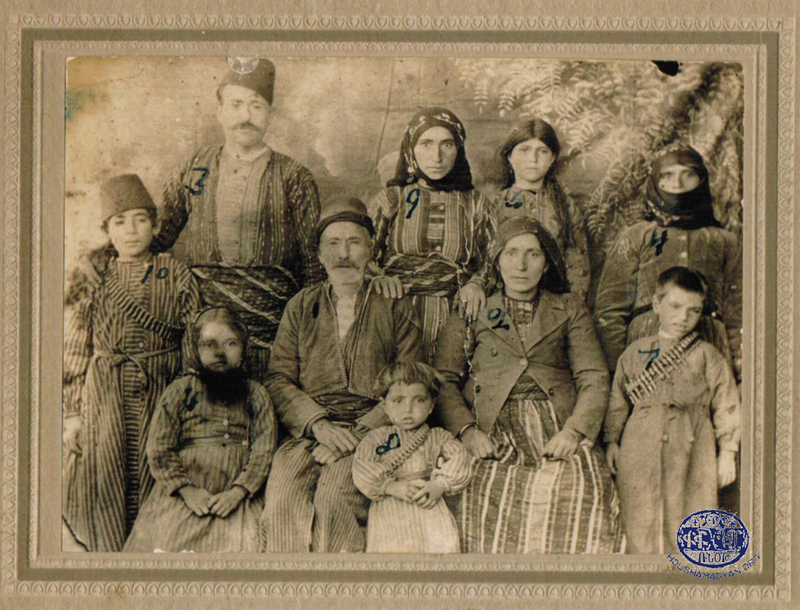 The 1894 Mamuretul Aziz yearbook stated the population was 317 Armenians (169 males and 148 females) in 56 households. On the eve of the genocide, the Armenian population had declined to 235 in 40 households. Shentil was a majority Armenian village. The 1834 Ottoman census detailed 358 Armenian males in 92 households and 85 Muslim males in 18 households. The 1840 census listed 326 Armenian males in 100 households. The 1878 Armenian census stated the population of Shentil to be 771 Armenians in 108 households and only 68 Turks. Eprigian stated the Armenian population was 711 along with 68 Turks. The 1894 Mamuretul Aziz yearbook indicated the Armenian population had reduced substantially to 511 (263 males and 248 females) while the Muslim population remained relatively static at 165 (78 males and 87 females). The total number of households was stated to be 132. The Armenian population of Shentil continued under duress and on the eve of the genocide only 245 Armenians in 45 households remained. While most sources only list one apostolic church for Sheykh Hadji, Teotig stated there was a second church named Sp. Asdvadzadzin. While today they are considered as two villages, all sources generally list a single village instead of separating the lower and upper sections. The lower section was populated by Muslims and the upper section by Armenians. Today, the lower section is under water. The 1834 Ottoman census register was damaged and thus we only have a partial listing of the Armenian men in Sheykh Haji (252 in 52 households). The Muslim register listed 223 males in 64 households. The 1840 census listed 336 Armenian males in 90 households. The 1878 Armenian census stated the population of Sheykh Hadji was 603 Armenians in 80 households and 258 Turks. Eprigian stated the population was 655 Armenians and 258 Turks. The 1894 Mamuretul Aziz yearbook stated the population was 600 Armenians (336 males and 264 females) and 445 Muslims (237 males and 208 females) in 188 total households. Once again we see a large disparity in the number of Armenian males versus females. It seems likely that the village contained close to 700 Armenians and 500 Turks. On the eve of the genocide, the recorded population of Sheykh Hadji was 590 Armenians in 72 households. Soursouri was an entirely Armenian village. The village is missing from the 1834 Ottoman census. The 1840 census listed 646 males in 134 households. A portion of these men were residing at the monastery (45 males in 5 households). The 1878 Armenian census stated the population was 1362 Armenians in 173 households. Eprigian stated the population was 1058 Armenians. The 1894 Mamuretul Aziz yearbook stated the population was 1094 Armenians (594 males and 500 females) in 179 households. Again, the women seem to have been undercounted as the male population was 20% greater. Thus, a population of over 1200 seems likely. On the eve of the genocide, Soursouri had a population of 1100 Armenians in 170 households. An image from the 1840 Ottoman census for the Tadem monastery. Tadem was almost entirely Armenian. The 1834 Ottoman census listed 738 Armenian males in 153 households and 13 Muslim males in 3 households. The 1840 census listed 637 Armenian males in 157 households. 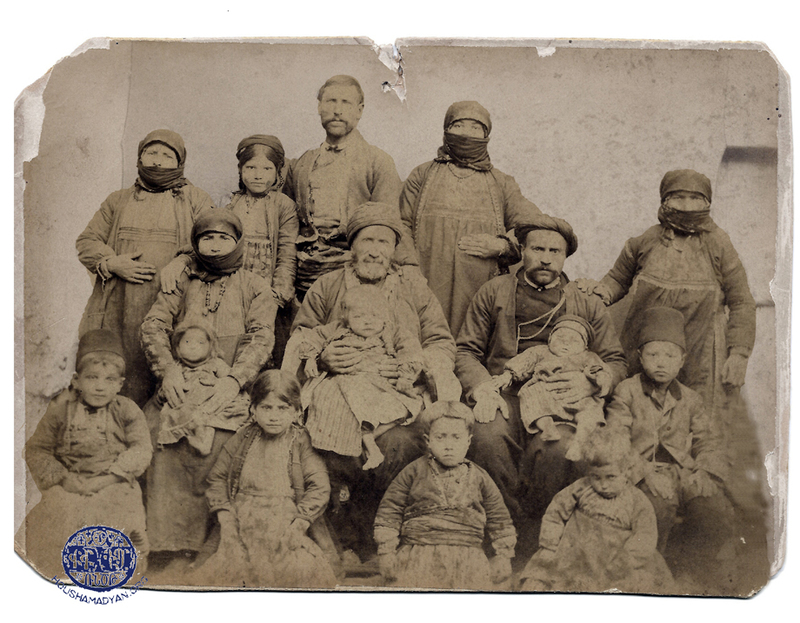 A portion of these Armenian men lived at the monastery (7 in 1834 and 13 in 1840). The 1878 Armenian census stated the population of Tadem was 1450 Armenians in 200 households and 46 Turks. Eprigian stated the population was 1452 Armenians and 46 Turks. The Armenian population of Tadem continued to thrive. The 1894 Mamuretul Aziz yearbook stated the population was 1582 Armenians (810 males and 772 females) and 57 Muslims (29 males and 28 females) in 266 total households. On the eve of the genocide, the population was 1300 Armenians in 225 households. The Hamidian massacres and emigration had taken its toll. The monastery remains today as the most visible sign of Armenian culture, surviving vandals for now, but under constant threat of collapse. The 1834 Ottoman census listed 56 Armenian males in 15 households. I did not locate Telandzig in the 1834 Muslim register. The 1840 census listed 57 Armenian males in 21 households. The 1878 Armenian census stated the population of Telandzig was 111 Armenians in 17 households and 236 Turks. Eprigian stated the population was 101 Armenians and 236 Turks. The 1894 Mamuretul Aziz yearbook stated the population was 88 Armenians (37 males and 51 females) and 219 Muslims (117 males and 102 females) in 86 total households. On the eve of the genocide, only 20 Armenians in 5 households remained in Telandzig, having lost over 80% of its population from the peak. A number of sources indicate there was a small Armenian population in the majority Muslim village of Unguzig. The 1834 Ottoman census listed 19 Armenian males in 4 households and 136 Muslim males in 33 households. There were an additional 35 Muslim males in 13 households recorded in a hamlet. The 1840 census listed only 12 Armenian males in 4 households. The 1878 Armenian census stated the population of Unguzig was 21 Armenians in 4 households and 426 Turks. Eprigian restated these same figures. The 1894 Mamuretul Aziz yearbook stated the population was 6 Armenians (3 males and 3 females) and 336 Muslims (167 males and 169 females) in 61 total households. On the eve of the genocide, there were no longer any Armenians recorded as living in Unguzig. The 1834 Ottoman census listed 180 Armenian males in 44 households and 34 Muslim males in 16 households. The 1840 census listed 184 Armenian males in 50 households. The 1878 Armenian census stated the population of Vartatil had grown to 521 Armenians in 61 households and 126 Turks. Eprigian stated the population was 510 Armenians and 126 Turks. The 1894 Mamuretul Aziz yearbook stated the population was 413 Armenians (216 males and 197 females) and 104 Muslims (56 males and 48 females) in 84 total households. On the eve of the genocide, the population had declined to 360 Armenians in 70 households. Vartatil is now a major settlement on the outskirts of the regional airport. Vartenik was a small mixed village. The 1834 Ottoman census listed 81 Armenian males in 17 households and 82 Muslim males in 29 households. The 1840 census listed 66 Armenian males in 15 households. The 1878 Armenian census recorded a further decline in the Armenian population to 35 in 7 households while the Turkish population also declined to 110. Eprigian restated these same figures. The 1894 Mamuretul Aziz yearbook stated the population of Vartenik to be 29 Armenians (21 males and 8 females) and 170 Muslims (99 males and 71 females) in 39 total households. The male to female ratio for Armenians is suspect but unexplainable. It could be that the Armenian families were gradually moving away and at this point mostly men remained to manage properties. Or it could simply be that the Armenian women were significantly undercounted as in other villages. On the eve of the genocide, Armenians were no longer recorded as living in Vartenik. Vedjan was a small cluster of houses not mentioned in early Ottoman census records. The 1878 Armenian census stated there were 65 Armenians in 8 households and 20 Turks. Eprigian stated there were 48 Armenians and 15 Turks in Vedjan. The 1894 Mamuretul Aziz yearbook stated there were 19 Armenians (9 males and 10 females) and 44 Muslims (27 males and 17 females) in 15 total households. The high Muslim male to female ration most likely indicates an undercount of the women. On the eve of the genocide, there were 30 Armenians in 5 households in Vedjan. Veri-Mezre or upper Mezre is rarely mentioned in sources. The early Ottoman census records do not mention the village nor does the 1878 Armenian census. Srvantsdiants stated the village contained 14 Armenian households. Eprigian stated the village was entirely Armenian with a population of 114. The 1894 Mamuretul Aziz yearbook does not list the location separately either. On the eve of the genocide, the population had grown to 197 Armenians in 30 households. Today, the location is within the city limits of Mezire [Elazığ]. Yegheki was not found in the 1834 Ottoman census, however the 1840 census listed 391 Armenian males in 90 households. The 1878 Armenian census stated the population was 1019 Armenians in 126 households and 478 Turks. Eprigian revised the Armenian population to 982. The 1894 Mamuretul Aziz yearbook stated the population was 1073 Armenians (573 males and 500 females) and 544 Muslims (282 males and 262 females) in 310 total households. Again, it seems women were undercounted and Armenian women to a greater degree than Muslim women. Yegheki continued to prosper and, on the eve of the genocide, contained 1610 Armenians in 253 households. Today, Yegheki is a neighborhood of Mezire [Elazığ]. In 2012, three lone tombstones were all that remained to document the Armenian presence in Yegheki. Today, maybe even those no longer exist. Yenidje is a common village name. Thus, sometimes it can be difficult to locate the exact village being referenced. Armenian Yenidje is north of Shentil and now is just south of the airport runway. The early Ottoman censuses do not list the village. The 1878 Armenian census indicated the village was entirely Armenian with a population of 101 in 16 households. Eprigian revised the population to 94 Armenians. The 1894 Mamuretul Aziz yearbook confirms Yenidje was entirely Armenian. The population was stated to be 71 (32 males and 39 females) in 13 households. On the eve of the genocide, no Armenians were recorded as living in Yenidje. There are two possibilities. First, the Armenian census simply missed the small village. The second possibility is that the Armenians of Yenidje converted to Islam prior to the genocide (forced during the Hamidian massacres) and, thus, the population today is descended from the original Armenians. Vahe Haig (Kharpert/Harput and its Golden Plain: Historic, Cultural and Ethnograohic Memory Book) is not entirely clear in this point although he mentions that the Armenians were slain or carried off. Yenidje is now considered a neighborhood of Parchandj. Vahe Haig stated the name of the church as Sp. Varvar, other sources indicate Sp. Asdvadzadzin. Yertmuneg is not found in the 1834 Ottoman census, however the 1840 census listed 219 Armenian males in 73 households. The 1878 Armenian census stated the population was 516 Armenians in 60 households and 30 Turks. Eprigian updated the population to 498 Armenians and 30 Turks. The 1894 Mamuretul Aziz yearbook stated the population was 453 Armenians (238 males and 215 females) and 70 Muslims (28 males and 42 females) in 95 total households. On the eve of the genocide, the Armenian population had been reduced to 365 in 70 households. Yertmuneg is now considered a neighborhood of Parchandj. While I did not identify Zartaridj in the Muslim register from the 1834 Ottoman census, the non-Muslim register listed 144 Armenian males in 36 households. The 1840 census listed 149 Armenian males in 48 households. The 1878 Armenian census stated the population as 211 Armenians in 30 households and 410 Turks. Eprigian stated the population of Zartaridj was 188 Armenians and 410 Turks. The 1894 Mamuretul Aziz yearbook stated the population as 213 Armenians (119 males and 94 females) and 441 Muslims (225 males and 216 females) in 122 total households. On the eve of the genocide, the Armenian population had been reduced to less 30% of its peak. There were only 120 Armenians in 13 households remaining. I would like to thank Vural Genç, Cihangir Gündoğdu, George Leylegian, Mihran Minassian, Khatchig Mouradian, and Vahe Tachjian for their help in translations and identifying important material as well as constant encouragement. In addition, I would like to thank the staff of the State Museum of Literature and Art in Yerevan and the T.C. Başbakanlık Devlet Arşivleri Genel Müdürlüğü in Istanbul. However, any errors or omissions are my own. Başbakanlık Osmanlı Arşivi (BOA) Nüfus Defterleri (NFS.d. ), folder 2675, “1250 (1834) Harput eyaleti, (Maadin-i Hümayun) sancağı, Harput kazası, müslim defteri”. Başbakanlık Osmanlı Arşivi (BOA) Nüfus Defterleri (NFS.d. ), folder 2676, “1250 (1834) Harput eyaleti, (Maadin-i Hümayun) sancağı, Harput kazası, reaya defteri”. Başbakanlık Osmanlı Arşivi (BOA) Nüfus Defterleri (NFS.d. 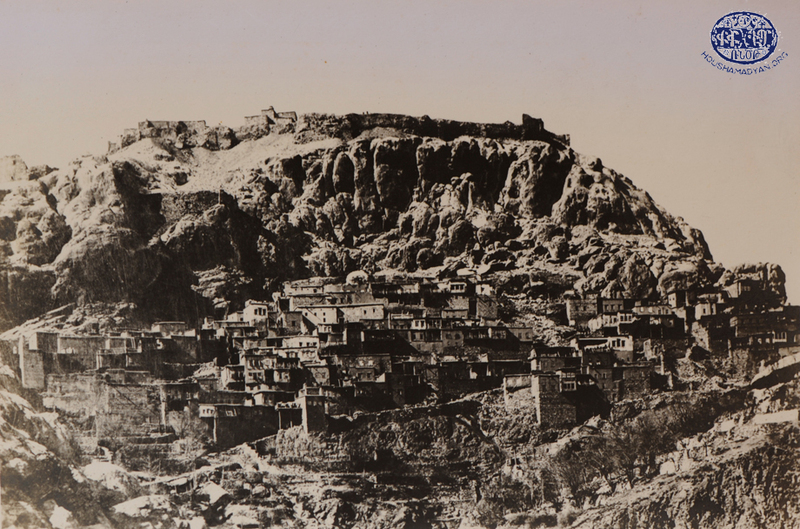 ), folder 2677, “1256 (1840) Harput eyaleti, (Maadin-i Hümayun) sancağı, Harput kasabası defteri. a.g.tt”. Başbakanlık Osmanlı Arşivi (BOA) Nüfus Defterleri (NFS.d. ), folder 2679, “1256 (1840) Harput eyaleti, (Maadin-i Hümayun) sancağı, Harput kazası, müslim aşiretler defteri”. Başbakanlık Osmanlı Arşivi (BOA) Nüfus Defterleri (NFS.d. ), folder 2680, “1256 (1840) Harput eyaleti, (Maadin-i Hümayun) sancağı, Harput, Uluabad, Kuzabad nahiyeleri, reaya defteri. a.g.tt”. Başbakanlık Osmanlı Arşivi (BOA) Nüfus Defterleri (NFS.d. ), folder 2681, “1262 (1846) Harput eyaleti, (Maadin-i Hümayun) sancağı, Harput, Kuzabad nahiyesi, Behremen nahiyesi defteri. a.g.tt”. Diyarbakır Salnameleri 1286-1323 (1869-1905). Diyarbakır : Diyarbakır Büyükşehir Belediyesi Yayınları, 1999. Elazığ il yıllığı, 1967. Elâzığ : Bingöl Matbaası, 1970. Elazığ il yıllığı, 1973. Elâzığ : Bingöl Matbaası, 1973. Elâzığ Vilâyeti. İller İdaresi Genel Müdürlüğü. sayı 20. Ankara : Harita Genel Müdürlüğünde basılmıștır, 1960. Soukias (Fr.) Eprigian, Պատկերազարդ բնաշխարհիկ բառարան [Illustrated Dictionary of the Historic Homeland], Vol. 2, Venice, St Lazarus, 1907. Genel nüfus sayimi, 20 ilktesrin 1935 [Recensement général de la population au 20 octobre 1935]. Its Neşriyat sayisi ; 75 [Publication ; no. 75]. Istanbul [etc.] 1936-. Genel nüfus sayımı: 20 İlkteşrin 1940 [Recensement général de la population au 20 octobre 1940]. Its Neşriyat sayısı, 158 [Publication ; no. 158]. İstanbul, Hüsnütabiat Basımevi, 1941. Genel nüfus sayımı: 21 İlkteşrin 1945 [Recensement général de la population au 21 octobre 1945]. Neşriyat 286 [Publication 286]. Ankara, 1948-50. Genel nüfus sayımı, 22 Ekim 1950 [Recensement général de la population du 22 octobre 1950]. Neşriyat 359 [Publication 359]. Ankara, 1950. Genel nüfus sayımı, 23-ekim-1955; vilâyet, kaza, nahiye ve köyler itibariyle nüfus [Census of population 23 Oct.1955; population by provinces, by districts and by sub-districts]. Istatistik Genel Müdürlügü Yayin 412 [General Directorate of Statistics Publication 412]. Ankara, 1961. Genel nüfüs sayımı, 23 Ekim 1960. İl, ilce, bucak ve köyler itibariyle nüfus [Census of population, 23 October 1960. Population by provinces, districts, sub-districts and villages]. Yayın no. 444 [Publication no. 444]. Ankara : T.C. Başbakanlık, Devlet İstatistik Enstitüsü, 1963. Genel nüfus sayımı : nüfusun sosyal ve ekonomik nitelikleri : 12.10.1980 [Census of population : social and economic characteristics of population]. Yayın no. 990 [Publication no. 990]. Ankara : Başbakanlık Devlet İstatistik Enstitüsü, 1982-. 2000 genel nüfus sayımı : nüfusun sosyal ve ekonomik nitelikleri [2000 census of population : social and economic characteristics of population]. Yayın no. 2704 [Publication no. 2704]. Ankara : Devlet İstatistik Enstitüsü, 2000. Kemal H. Karpat, Ottoman Population, 1830-1914: Demographic and Social Characteristics. Madison, Wisconsin 1985. Raymond H. Kévorkian and Paul B. Paboudjian, Les Arméniens dans l'Empire Ottoman à la veille du genocide, Paris, ARHIS, 1992. Köylerimiz. Ankara : Ministry of the Interior, 1928. Mamuretül aziz Vilâyeti, 1298 (1881M) Tarihli Mamuretül aziz Vilâyeti Salnamesi. Elazig 2001. Mamuretül aziz Vilâyeti, Mamuretül aziz Vilâyeti Salnamesi. 1312 (1894). Boghos (Fr.) Natanian, Տեղեկագրութիւն ընդհանուր վիճակին Սեբաստիոյ եւ անոր կուսակալութեան ներքեւ գտնուղ մէկ քանի գլխաւոր քաղաքաց [A Report on the General State of Sepasdia/Sivas and some of the Main Cities within its Prefecture], Constantinople, Hayasdanyats Press, 1877. Harutyun Kh. Shapuhian, Պատմութիւն Քօրփէ կամ Քէօրփէ գիւղին [History of Korpe or Körpe Village], 1917, revised in 1958, Lowell (USA), printed on March 4, 1959 (handwritten manuscript copy). Karekin (Fr) Srvantsdiants, Թորոս Աղբար, Հայաստանի ճամբորդ [Toros Aghbar, a Traveler through Armenia], Vol. 2: printed by G. Baghdadlian (Aramian), Constantinople, 1884. 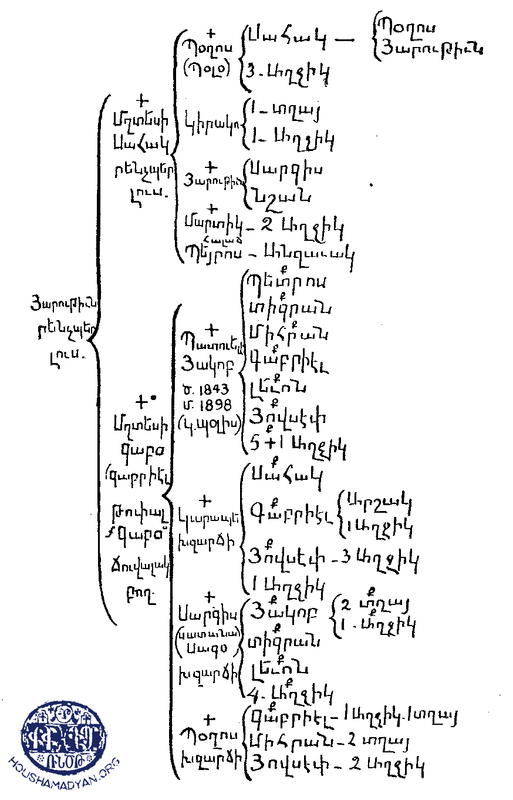 Վիճակագություն Խարբէրդի Նահանգի [Statistics on the province of Kharpert], 27 April 1878. State Museum of Literature and Art. Toros Azadian collection, folder 44. Teotig, Գողգոթա հայ հոգեւորականութեան եւ իր հօտին աղէտալի 1915 տարին [The Calvary of the Armenian Clergy and its Followers in 1915], New York, 1985. Vahé Haig, Խարբերդ եւ անոր ոսկեղէն դաշտը. Յուշամատեան պատմական մշակութային եւ ազգագրական [Kharberd/Harput and its Golden Plain: Historic, Cultural and Ethnograohic Memory Book], New York, 1959. 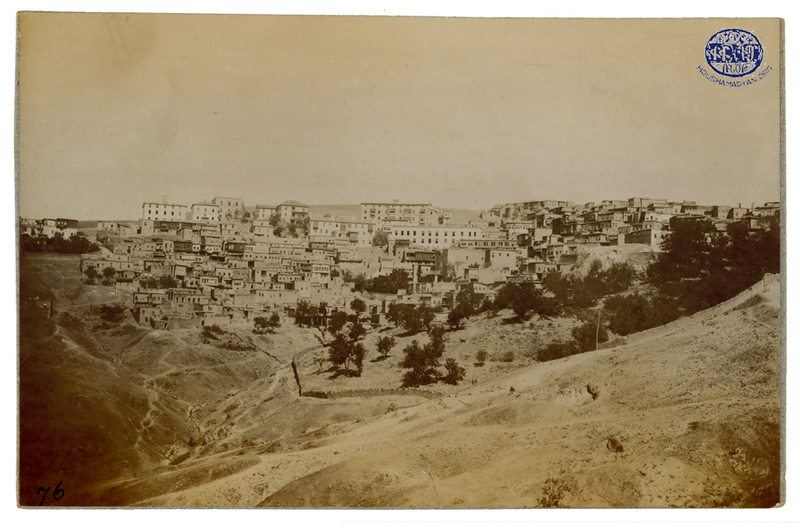 Süleyman Yapıcı, Osmanlı salnamelerinde Harput (1869-1908). Elazığ, 2009. Heer Generalstab Turkei 1:200,000. Berlin, 1931. War Office, Intelligence Division by Major F. R. Maunsell. Eastern Turkey in Asia 1:250000. London, 1901-1921. War Office, General Staff. Geographical section, Turkey 1:200,000, London,194?